Sometimes I get carried away at the fresh fruit and produce stands in the summer and buy more than I really will use. Then again, that happens when the grocery stores stock their produce department so beautifully. 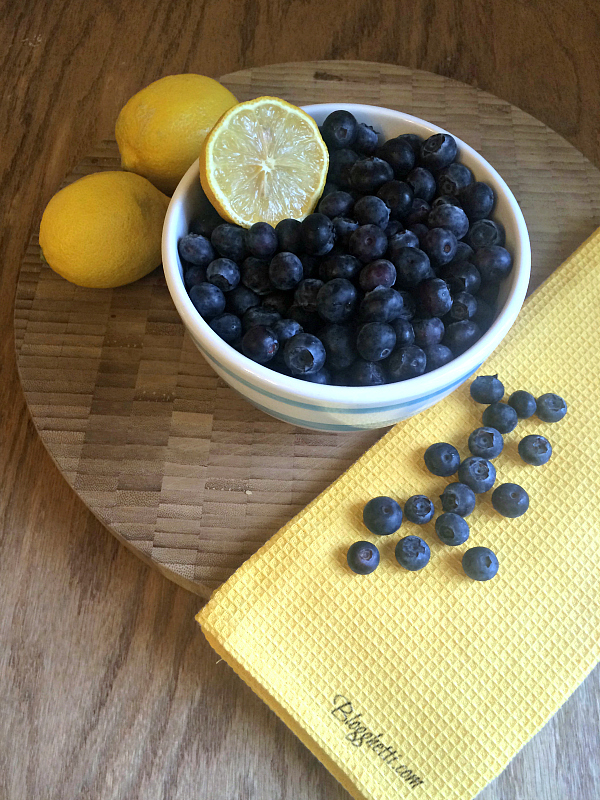 I recently bought fresh blueberries – what seems like a ton of the juicy little blue marvels. I flash froze about half of them by lining a baking sheet with parchment paper and then in a single layer added the blueberries. Placed the tray in the freezer for a about 30 minutes and then when they were frozen, I filled a resealable plastic bag and placed them in the freezer. This way when I need just a cup of blueberries for smoothies or a recipe the berries aren’t all in a clump and I can get exactly what I need. The remaining berries I used for smoothies, fruit salads, and this delicious Blueberry Lemon Pound Cake. 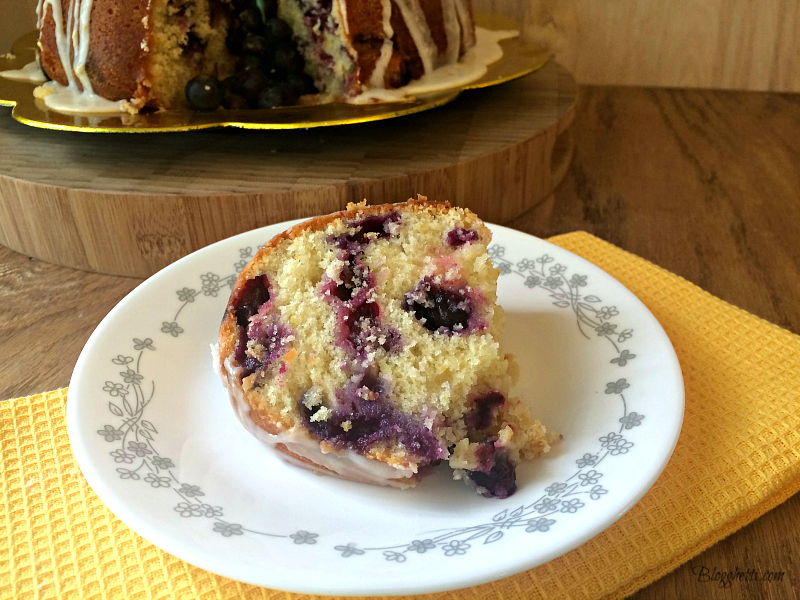 Oh my gosh, this cake is filled with fresh blueberries bursting with sweet and tart flavors and the fresh lemon juice lends to the cake’s moistness and adds a bit of zing. It’s topped with a lemon glaze made from fresh lemon juice and powdered sugar. This cake is so good – for dessert, breakfast, or any time. 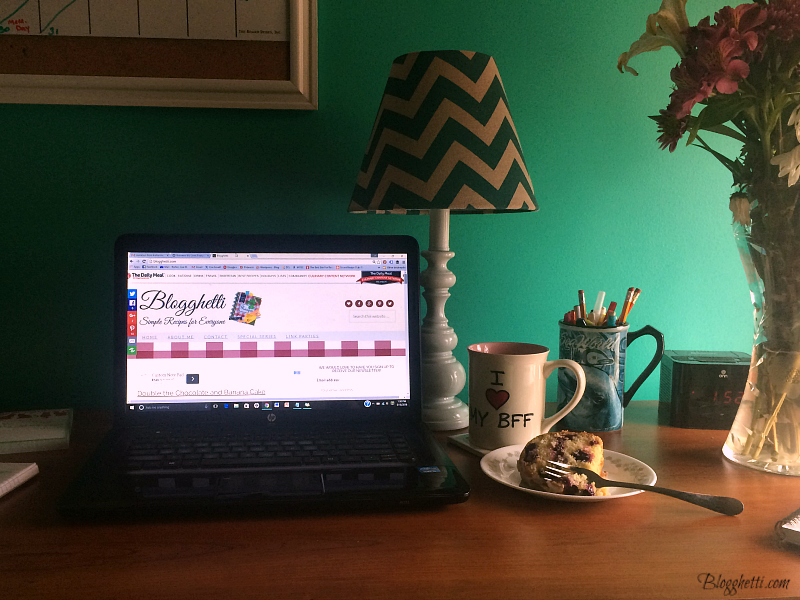 In fact, this was my afternoon snack while I worked on blog posts. I actually had to make this cake not once, but twice in a week’s time-span because it looked so good that the family cut into it before I could photograph it! There were no complaints that I had to make it twice or that they had to eat it for days. It’s that good. 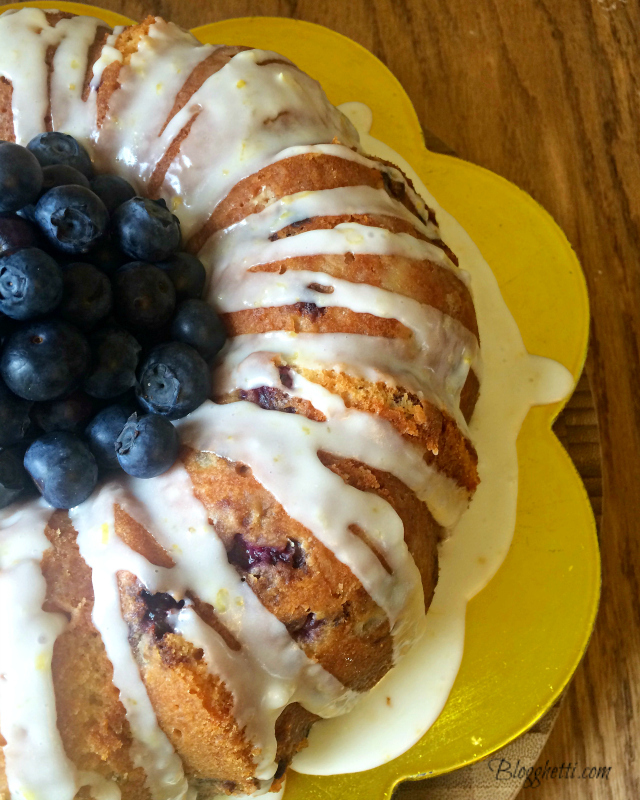 Just look at the blueberries bursting with color in this yummy Blueberry Lemon Pound Cake! So good ya’ll! The batter for this cake is thick and fits in a 10 iuch Bundt pan. I could eat this cake with or without the lemon glaze! The remaining berries I used for smoothies, fruit salads, and this delicious Blueberry Lemon Pound Cake. This cake is filled with fresh blueberries bursting with sweet and tart flavors and the fresh lemon juice lends to the cake's moistness and adds a bit of zing. It's topped with a lemon glaze made from fresh lemon juice and powdered sugar. Preheat oven to 350 degrees F. Grease and flour a 10-cup Bundt pan; set aside. In a large bowl, mix and combine dry ingredients together; set aside. In the bowl of your stand mixer (or large mixing bowl): add the sugar and lemon zest. Using a fork to rub together the sugar and lemon zest until the zest is completely incorporated and the sugar is evenly moistened. This will distribute the zest evenly in you cake batter instead of having it clump together. Add the butter and cream together on medium speed until light and fluffy for about 5 minutes. One at a time, add the eggs and beat an additional minute before adding each egg. Add the vanilla and mix for one more minute. Add dry ingredients alternatively with the buttermilk to the butter/sugar/lemon zest/egg mixture ending with flour. In another large bowl, combine the blueberries and the remaining 2 tablespoon flour, gently tossing together so they are evenly coated. This will help the blueberries from sinking to the bottom of the batter while baking. 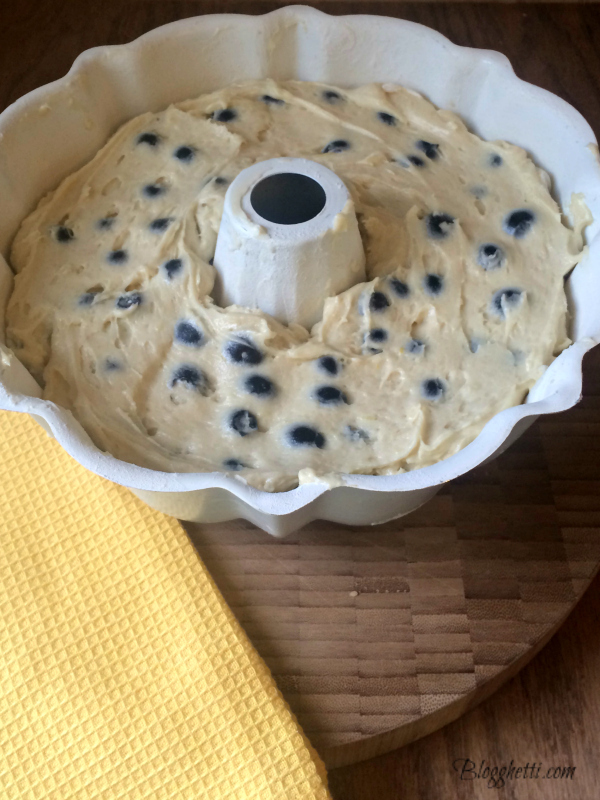 Using a wooden spoon, gently fold the blueberries into the cake batter. Spread the cake batter in the prepared pan and smooth the top. The batter will be thick. Bake for 55 to 60 minutes, until a cake tester comes out clean. When the cake has 20 minutes left to bake, prepare the lemon syrup and let cool while cake is cooling. To prepare the lemon syrup: Over medium heat, heat the lemon juice and sugar in a small saucepan until the sugar is completely dissolved. Once dissolved, continue to cook for 3 more minutes. Remove from heat and set aside to cool. Cool the cake in the pan on a wire rack for 15 – 20 minutes. Poke holes with a wooden skewer all over the top of the cake. Brush the tops and sides of the loaves with the lemon syrup. Let the syrup soak into the cake and brush again. Use up all of the syrup. Let the cake cool for at 20 - 30 minutes and then turn it out onto a serving platter and let cool completely before glazing. To prepare the Lemon Glaze: whisk together the powdered sugar, lemon zest, and lemon juice until smooth. The glaze should be thick but pourable. Start with the 2 tablespoons of lemon juice and add more until the desired consistency thickness occurs. Pour over Bundt cake. Let harden before serving. Cover and refrigerate leftover cake. 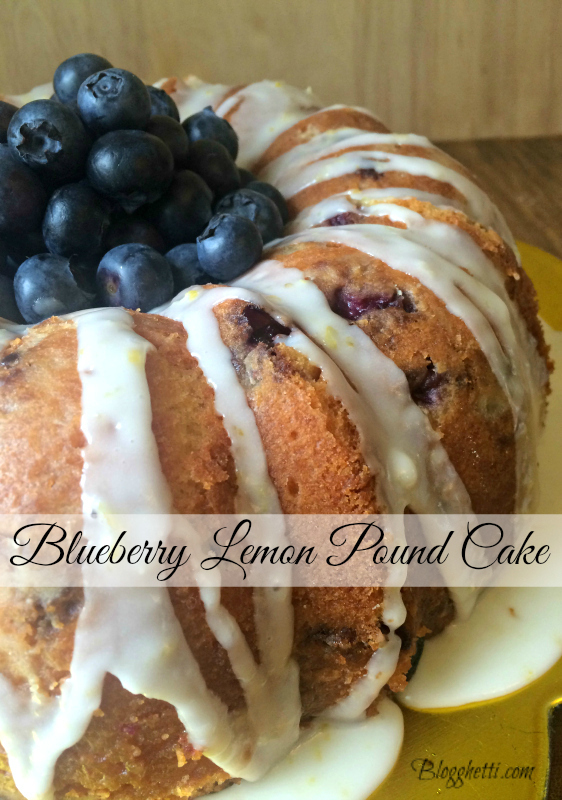 Your Blueberry Lemon Pound Cake looks so pretty. I just love the blueberry and lemon combination for your cake, delicious! I really appreciate you sharing with us at Full Plate Thursday and hope you have a great weekend! Thanks Helen! 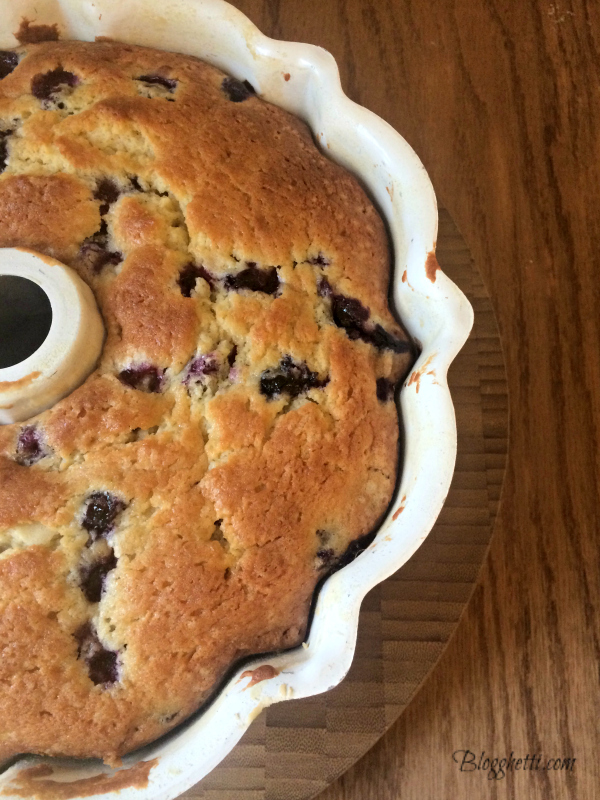 I was just thinking it was time to make this cake again as I have fresh picked blueberries on hand!